We are back into rainy weather again which is so disappointing as we've had some great weather the last 4 weeks. I am still so extremely tired which is why I haven't blogged much but also I've been getting through the last of my letters so have spent a little time online which is why many of you haven't had comments on your blogs. I have managed to complete a few projects off my list lately at least which has been nice and from tomorrow I'll start a new project. Its going to be in a childrens theme which I've never done before so I hope it will work out. I should get on to pinterest for inspiration. I have a week of my holiday left and I really hope that a house comes up that I can view and hopefully by. I've had so many cravings this week for sweet and sugary things so I'll soon be piling the pounds one... still I do keep forgetting to eat! My niece and I went to the supermarket one day and there was a special event going on at the opticians, she had her face painted and was over the moon... it was so sweet. I wish I could stay home all day crafting as I've loved the bigger projects I've done. I just need the weather to be on my side sometimes. How are you? It seems like such a long time I've heard from any of you :). It was just a shame it keeps pouring with rain. 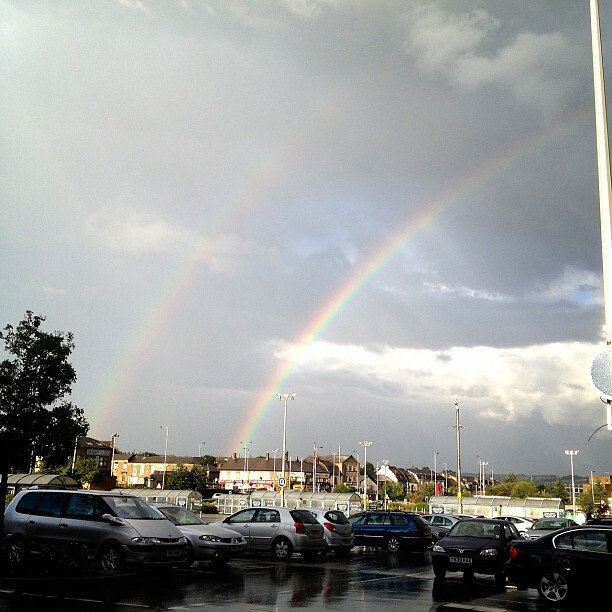 OOOH, a double rainbow! Hope that you made a wish! I'm sure you will do well with your new project, there just isn't enough time in the day to get through everything I plan to do...LOL, who am I kidding! Oh! I didn't know you were supposed to make a wish because of course I would have made many :D.
Hopefully you'll be able to start some projects yourself with your supplies that you purchases recently.